Today, as I was focusing on other things, I realized that I’m flying out of New York in a couple of weeks on a small plane. If you’ve read my blog very long, you know that I am no longer worried about fitting into seats on a regular flight, but these commuter planes (which are tiny even for people with average frames) are far from comfortable for their overweight passengers. I’m flying to Oklahoma, and there is only one direct flight per day out of the NYC area. I paid more $$ for that flight because it’s direct, but also because I thought I wouldn’t have to fly on one of those small planes from Dallas or Chicago into Oklahoma. Now I’ve learned that I have to fly on the small plane from New York directly into Oklahoma. Really? Yes. So what’s an overweight girl to do? I called the airline, of course. And I reserved a stand-alone seat on the left side of the plane so I won’t be crowding anyone but myself. That’s fair enough, isn’t it? 🙂 I also asked how many inches the seat is, and I’m happy to report that I can deal with it. Don’t get my wrong. The seat is small, but it’s doable. I am no longer worried about being bumped from the flight which is extraordinarily important to me. I love to travel, and whether I’m going to a beautiful island or to visit loved ones, I just want to get there as quickly and seamlessly as possible. I wonder what this flight will be like. I wonder if I’ll have to cram myself into the tiny seat for 3 hours. If so, I’ll gladly deal with it because at least I won’t be crowding anyone else. With that in mind, I can do this. I’ve come so far on this journey, but on days like this I remember that I still have a long way to go. What’s most important is that I’m on my way. I’m working on myself inside and out, and I know that someday – perhaps even a year from now – this worry will be a thing of the past. Until then, I’ll just be thankful for the wonderful customer service representative who allowed me to reserve that particular seat. I also want to take a moment to talk about the PE WC. Day 2 was another success for me. I drank over 16 glasses of water (which is okay based on my body weight,) and I’m still going strong. If you’re rocking this water intake like I am then you might need to be reminded that your body will adapt. It will just take some time to keep drinking! Also, be sure to go to aol.com this morning to read all about Sean! He’s on their homepage today! First, that picture is sooo cute! Second, hahaha, I am the queen mother in freaking out over things I cannot control… and things that I can… and things that aren't even things… Ummm, anxiety is my thing. sigh. If you've read my post lately, you know that I had a meltdown when I weighed myself and realized that I was would be at a normal weight by the end of summer–not thin or at goal–but normal. Who gets anxious over that?! Apparently, I do. There, now don't you feel better? chuckle. Yay! I'm not the only one! LOL I've been called a drama queen, control freak, worrywart… When it comes to freaking out about stuff, especially when I have no control over it, I am right there with ya. You are not alone! I completely understand the anxiety you're expressing in this post. I know that it's hard to fully be confident in this—but, you must know—You're going to be fine on that flight. I'll be waiting on the other end. You're beautiful–and your transformation is remarkable—your photos page—wow, just amazing how far you've come along this road—and baby–this is just the beginning. Remember how wonderful you felt after your flight to Louisiana? You'll feel even better after this flight to Oklahoma. The water challenge—I LOVE your water drinking picture!!! It's incredibly you. Sounds like you're flying on an ERJ135 or 145, and on the right side, the single seats are actually quite comfortable. And I say this as a not-quite-as-fat-as-I-used-to-be guy, who always used to need a seat belt extension. Oops, I mean left side, of course. Of course, you are not alone in having fears of things you can't control! It was very thoughtful of you to consider, not only your comfort, but the comfort of others when you reserved your seat. That is going above and beyond, and you are FANTASTIC!! You will have a good flight and a wonderful visit. Thanks for being so honest and uplifting and for sharing your transformation with all of us! And yes, Kenz, I freak out about weird stuff too. Then sometimes I look back and think, "Gosh, that wasn't so bad now, was it?" It's funny the things we so quickly allow our minds to put something out of control. Something so simple. We all do it – I am notorious for it. I think you will surprise yourself, you have come so far, and when you sit down in the seat, you will likely realize just how far you have come! Water is my mortal enemy, we have been trying to conquer each other for years, and this time I'm winning, not without water throwing punches my way and making me pee every five minutes… LITERALLY! I can only hope and wish one day, when I drink 48oz of water a day that I will pee like a normal person, but for now I'm a 22 year old female with 90 year old man bladder. How cute are you in that water pic! You're awesome! I have been following your blog for about a month now- I'm trying to lose about 30 pounds and I get a lot of motivation from you! 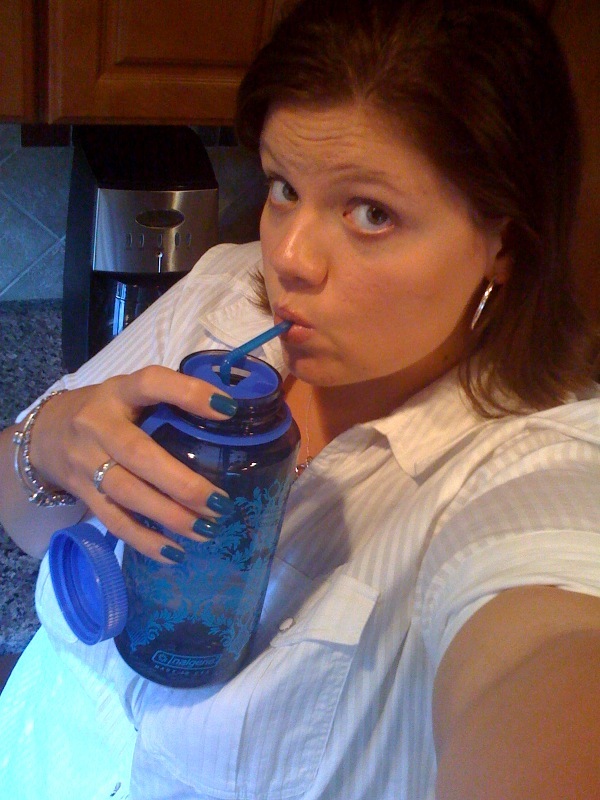 Thanks for the water challenge – met my 64 oz and then so today!!!!! Kenz – no worries about the seat. You will be just fine, I just know you will! I'm totally rocking this water challenge – got in another gallon of water today. You'll be fine on the plane. Enjoy your trip! i know this is not really about your post so i hope you will forgive. i was wondering why WWs? what was about the that made it what works for you? i am trying to figure out what will be a good place for me and have been looking at doing WWs. I don't think it matters if you join WW or if you just count calories. I chose WW for a number of reasons – the biggest being that I'd have a place to weigh-in every week. And I also like the accountability they offer by being there at the same time every Thursday. What has worked for me so far isn't magical. I just eat less crap, enjoy healthier foods on a regular basis and exercise. Okay let me just say….I'm too chicken to even fly so you're WAY ahead of me in the facing your fears game! And have I mentioned you're too freaking cute for words? Super cute picture of you drinking water!! I would be scared to fit in the seat, too. I carry most of my weight in my behind and hips, unfortunately, so I always worry about that kind of thing. Just think, though, soon enough it will all be a distant memory and…oh the trips you will take then!